Traditional Highlander weaponry gets an elegant twist within the Red Gem Scottish Fantasy Dirk. Made entirely of solid stainless steel, this fantasy sgian dubh features a round red gem inset at the base of its Celtic knotwork hilt. This Highlander dagger features a spear point blade with small serrations and a narrow fuller near the hilt, providing versatility, balance, and detail to its overall design. Twisting, solid steel knots make up the hilt, ending to encompass a multifaceted red gemstone. With an included black composite sheath decorated with a matching steel tip, this Celtic dirk will add a sense of regality to Highlander reenactment outfits. 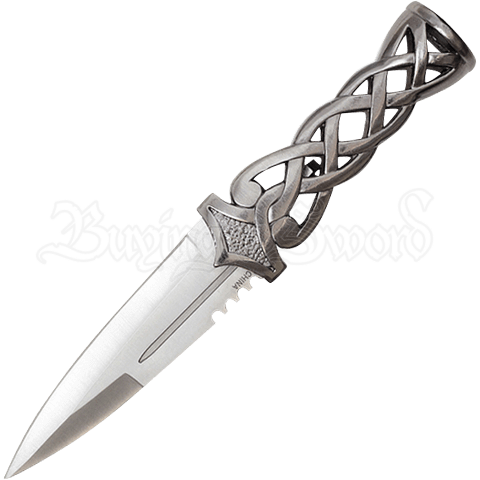 Collect and display this stylish Scottish dagger, or gift it to a loved one fond of Celtic elegance.